So here’s the thing…our first sales season is coming to an end and we could not be more pleased with our progress to date. We sold out of our Viognier weeks ago and do not have much stock left on any of our other wines. We are so thankful to all the people that turned in to our driveway and made the somewhat scary trek down it! 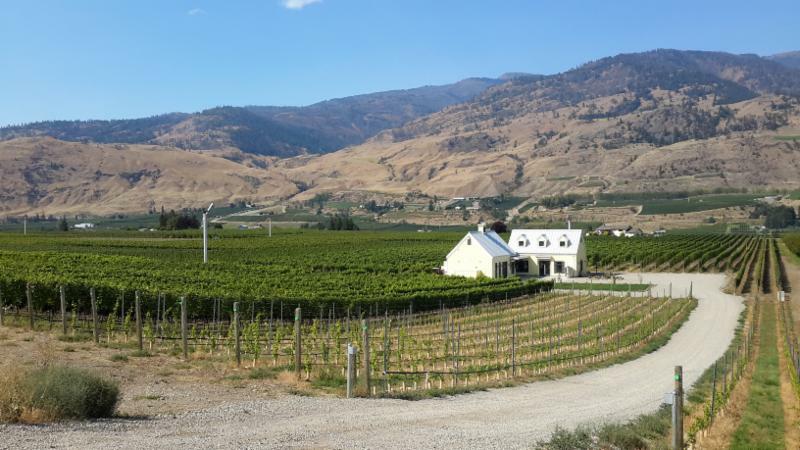 We have had visits from family and friends, visitors from other wineries, visitors from other parts of Canada and even visitors from Europe, Australia and Asia! It has been exciting to be in the tasting room every day. And once again, we cannot say thank you enough to our neighbouring wineries that send guests to us every day. After Thanksgiving Day, we will be open only on Saturdays from 11 am – 5 pm through to October 27th while we finish our harvest. We will also be able to ship wines until Friday, December 7th…more on that later. Here is a photo of our Viognier that I took last week. 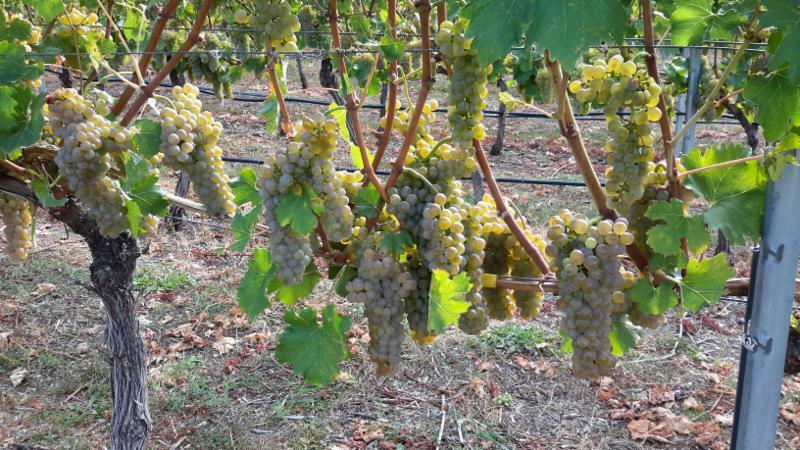 We are impatiently waiting for our winemaker to tell us to harvest these little beauties. It may be as early as Friday (fingers crossed) as the sugars have reached the desired level but we are still waiting for the acids to drop a pinch more. We are thrilled as the crop this year is heavier than last and so we will have more of this beautiful wine to sell in 2019. This is a shot of our Syrah, again, a photo from last week. They have looked this ripe for weeks now but we can’t be fooled – they are not ready for their date with the pruning shears just yet. We think we have at least 10 – 14 days until we harvest these and our Cabernet Franc. We are holding our breath a bit as the nights are getting cold and we don’t want the frost to get to the leaves before we are ready to harvest. We are not completely experienced farmers yet so I suspect we are more nervous than our neighbours! It has been quite a steep learning curve for us but we are trying to take things in stride and one step at a time.This is a shot of our Syrah, again, a photo from last week. They have looked this ripe for weeks now but we can’t be fooled – they are not ready for their date with the pruning shears just yet. 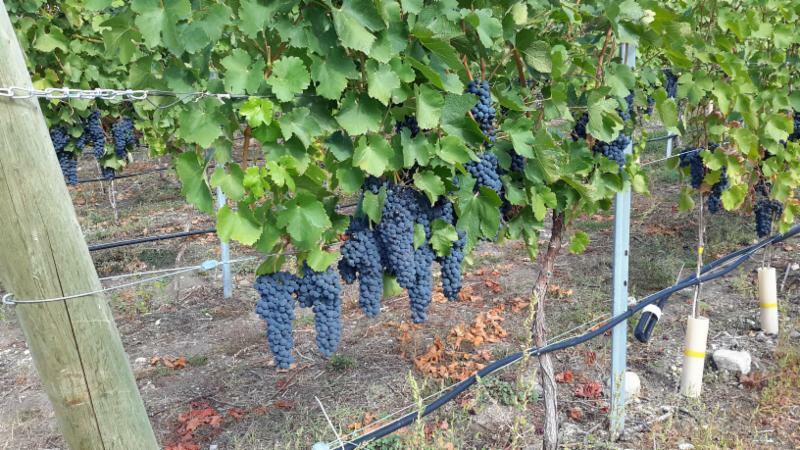 We think we have at least 10 – 14 days until we harvest these and our Cabernet Franc. We are holding our breath a bit as the nights are getting cold and we don’t want the frost to get to the leaves before we are ready to harvest. We are not completely experienced farmers yet so I suspect we are more nervous than our neighbours! It has been quite a steep learning curve for us but we are trying to take things in stride and one step at a time. Yesterday was an absolutely miserable day here. I took this shot out the tasting room window looking at our crush pad. I had plenty of time to take pictures as very few people were braving the weather to go wine tasting! At the same time as this photo was taken, Jamie was driving south from Penticton and drove through the most hellish hail storm. 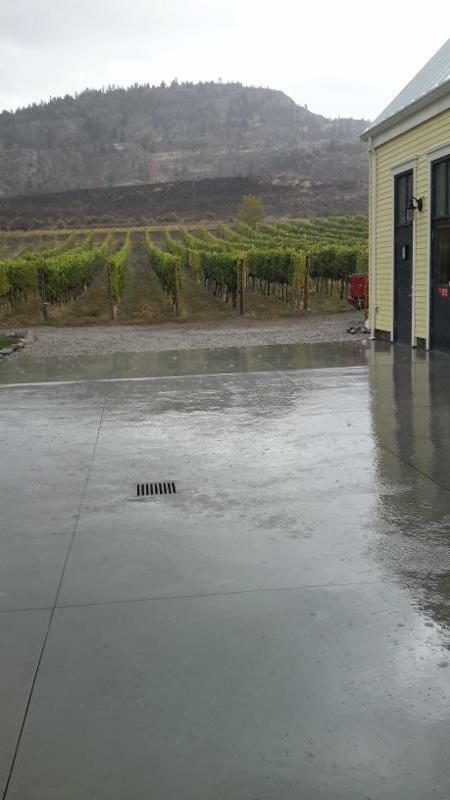 This is very worrying for grape growers that still have fruit hanging as hail can do a lot of damage in a very short time. We got lucky and I hope everyone else was just as lucky.Yesterday was an absolutely miserable day here. I took this shot out the tasting room window looking at our crush pad. I had plenty of time to take pictures as very few people were braving the weather to go wine tasting! At the same time as this photo was taken, Jamie was driving south from Penticton and drove through the most hellish hail storm. This is very worrying for grape growers that still have fruit hanging as hail can do a lot of damage in a very short time. We got lucky and I hope everyone else was just as lucky. These grapes peeking at us from the picking bins are orange muscat. We got the opportunity to purchase these grapes from a friend that has a vineyard just across the street from our house. He also helps us at our place with tractor work and all manner of great advice from pruning techniques to watering schedules. 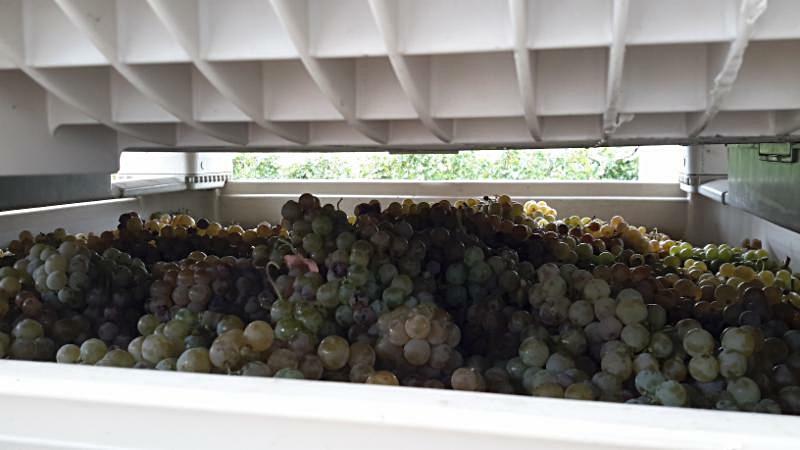 So, we are happy to say that we will be adding a single varietal orange muscat wine to our lineup next year. The wine has finished fermentation and the aromas are absolutely out of this world. We have left a touch of residual sugar and the wine also has lovely texture. We cannot wait to share it with everyone! And also, I will get to dream up another fun name for this new wine. While on the subject of next year, we are also adding a single varietal Cabernet Franc. We tasted this several weeks ago with the winemaker and are delighted with the results. To be honest, I sneak over to the barrel room every couple of days to taste again…all in the interest of quality control, right? So, next year, we will have eight wines to offer our guests. We are considering developing a wine club but haven’t made a final decision yet. 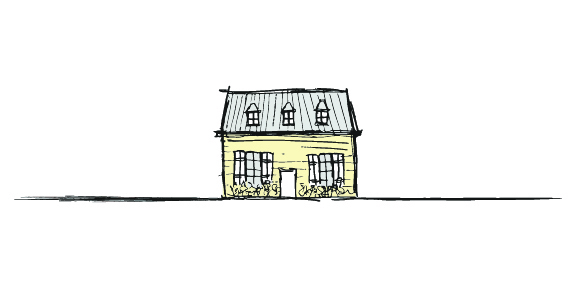 Maybe with another year’s experience in the tasting room, we will have a good feel for whether to move forward or not. So much to learn! So, back to shipping wines…even though the tasting room will close, we will still be here looking after the fermenting red wines until they go into barrel sometime in early December and we want you to continue enjoying our wines all winter long. To help in that effort, we are offering free shipping for wine orders of 12 bottles or more to a business address anywhere in B.C. For our friends in Alberta, a flat rate of $25 for shipping, again, 12 bottle minimum and to a business address, please. For anywhere else in Canada, we can customize a great rate for you! 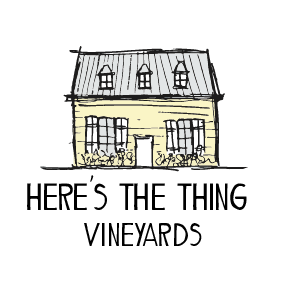 Please visit our website or please feel free to call the winery (I will have the phone with me after the winery closes) or send me an email – I’m always happy to answer questions. In the meantime, have a very Happy Thanksgiving. We hope that you have much to be grateful for. We certainly do!